If you shop at one of our participating Loyalty stores, you can collect points on every purchase of ROYAL CANIN® products. Simply present your Loyalty card when you purchase. You can download a digital version of your loyalty card from our Loyalty Card partner Stocard. 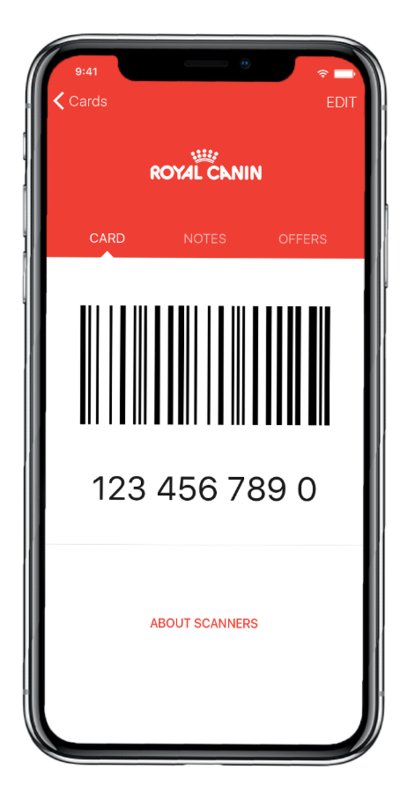 Simply download the Stocard app on Google Play or App Store, add your ROYAL CANIN® Loyalty card (by scanning your physical card or entering in your card number) and then just show it in store when you purchase or to redeem your points. If you don’t have a loyalty card already or you need a new card, you can generate a new one in the Loyalty Card section below. Use your loyalty points against vouchers! 300 points are worth £3, 500 points are worth £5 and 1000 points are worth £10. You are about to spend points to get a £ voucher, which we'll send to you by email. Just enter a postcode below to choose and select the stockist below, and we'll issue your voucher for you to print off and take with you to claim your discount. You are about to spend points, to get a £ voucher, which can be redeemed at . If you want to change your voucher selection, please click 'Change', otherwise please click 'Confirm'.